We flew to Calgary (below left) on July 1, 2007, for our second tour of the Rockies. We rode about 700 miles in three weeks. 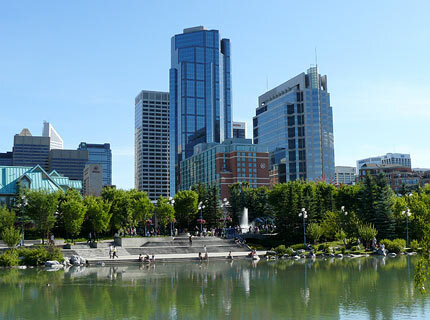 On arrival in Calgary we stayed with friends Rowland and Mary Evans. 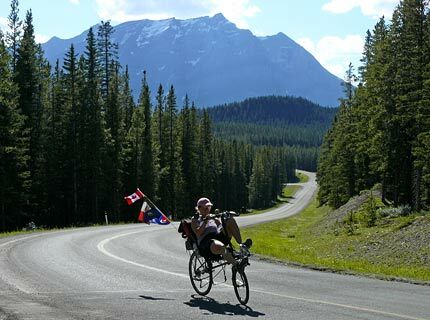 They dropped us at the bus to Canmore, from where we rode back east a short distance, towards Calgary, in order to pick up Route 40 South, the Kananaskis Trail. On the way we picnicked beside a lake (below right), actually a wide part of the Bow River. 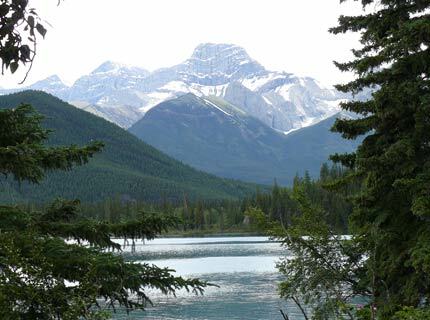 Kananaskis refers to a large provincial park and also a region, basically the eastern foothills and front range of the Rockies from Canmore and Banff southwest toward the U.S. border. 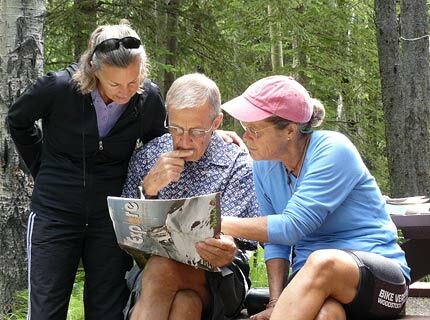 When we arrived in Kananaskis, Rowland and Mary drove out from Calgary to meet us for a day trip. Below, we plan our outing. At the outset, near Kananaskis Village, we were confident about our route, a trail that was recommended to us by a young provincial park employee (above). His advice was not perfect for us old folks (above). 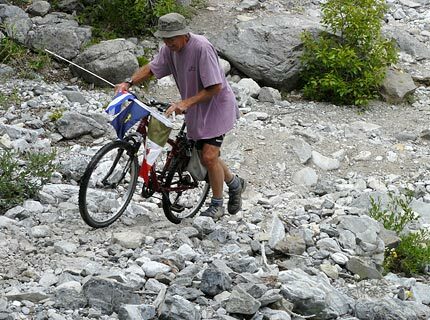 Barbara and I could have flown our fully-loaded recumbents to the moon just as easily as we could ride them on parts of this trail. 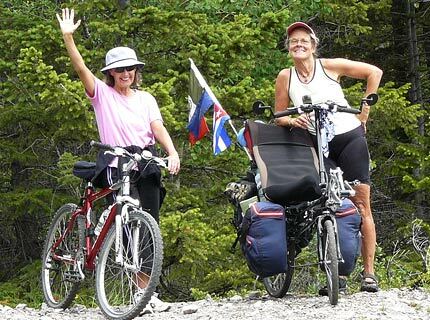 Barbara and Mary are triumphant (left) not because they climbed the hilly trail, but because they finished pushing their bikes to the top. 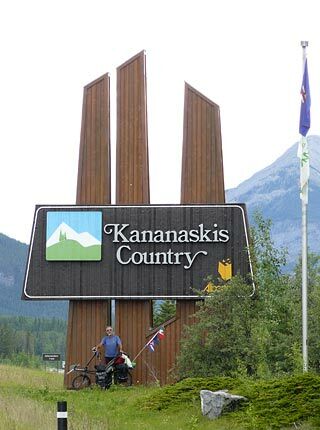 Too soon, Rowland and Mary headed back to Calgary and we continued into Kanananaskis Country. It was just as beautiful as we had been told (below). 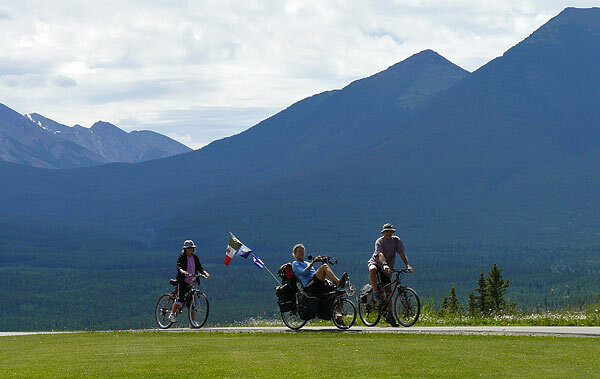 After leaving Rowland and Mary, we cycled into Peter Lougheed Provincial Park and camped near the Kananaskis Lakes (right). 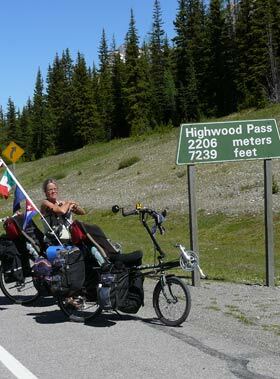 The next morning, we set out with some trepidation to climb over Highwood Pass. 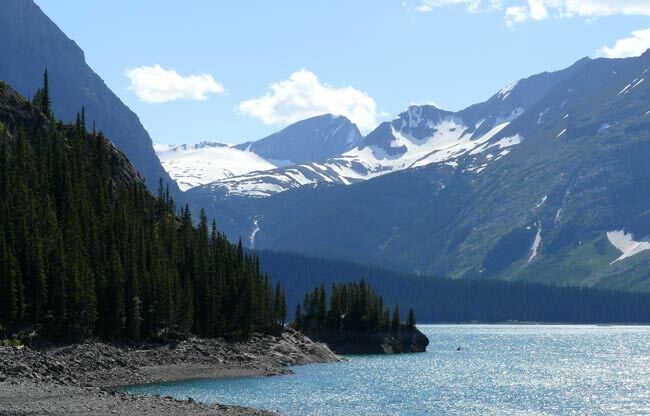 At 7239 feet, it's supposedly the highest paved road in the Canadian Rockes, about 800 feet higher than Logan Pass in Glacier National Park. However, it didn't seem terribly high compared to some of the roads we've cycled in Mexico, and we got up more easily than we'd expected. 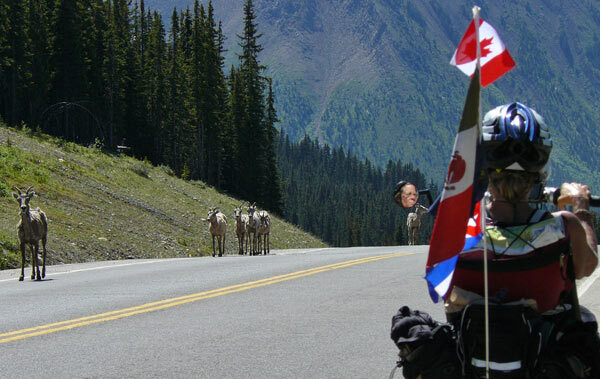 We encountered some traffic on the way (below left). After Highwood Pass (below right), our route turned east and descended to Longview, on the edge of the prairies.